Last week Microsoft released a “Community Technology Preview” of SQL Azure, a hosted version of Microsoft SQL Server 2008. In addition to the SQL Azure CTP, Microsoft also has a CTP for Windows Azure, where you can deploy web and worker roles – similar to how we deploy ASP.NET web sites and Windows Services (*nix daemons). These are exciting news for developers and systems architects who have tried to deploy scalable web sites or services. The initial capital costs can easily go over $50,000 when you need a web farm of load balanced servers on a rack at your local hosting company. In the last few days I spent some using the SQL Azure training kit getting my hands dirty with both Windows Azure and SQL Azure. One of the issues you run into right away is that SQL Azure only accepts a subset of commands that are available in an on-premise SQL Server 2008 instance. 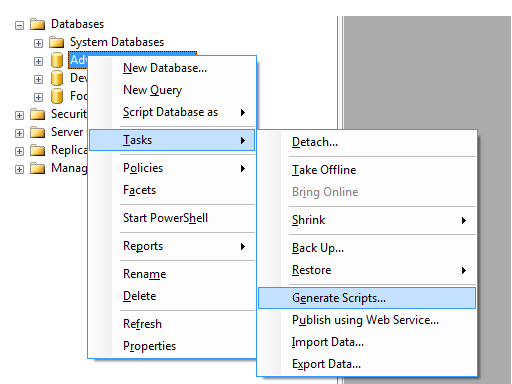 If you generate a script in SSMS you need to clean it up before creating the same database on SQL Azure. The Windows Azure Platform Training Kit includes a hands-on-lab called “Migrating Databases to SQL Azure” which takes the AdventureWorksLT2008 sample database and shows you in detail what needs to be cleaned up. I followed the steps in this lab and took some notes. I thought it would be a good idea to publish a summary of these notes here – others might find it useful – you’ll find the notes below. SQL Azure does not support User Defined Data Types. You should use this option to convert any user defined types into their underlying base types. Once the script is generated, you’ll need to delete some statements – here are the details. Remove the following options within each index definition. Ensure you keep the appropriate commas separating the remaining options. Add as needed, make sure every tabel in SQL Azure has a clustered index (before data is inserted into it). The partition key column for table 'SalesLT.vProductAndDescription' is undefined. This is the failure in the creation of an index on a view. This is not supported in SQL Azure but for our purposes we can ignore it - it is a non fatal error. It simply means this object will not be created. This page contains a single entry from the blog posted on August 24, 2009 3:08 PM. The previous post in this blog was Forced to use VMWare on Windows Server 2008 R2, Hyper-V still doesn’t work. 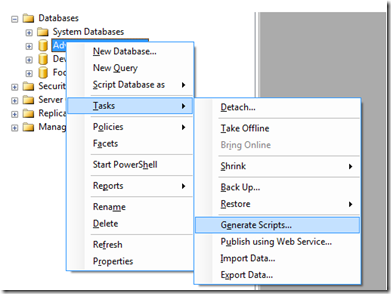 The next post in this blog is Windows PowerShell commands to clean up scripts for SQL Azure.